April 22, 2016 – Today popular historian and frequent TV news guest, Doris Kearns Goodwin discusses how Theodore Roosevelt overcame serious ailments as a child to become one of our nation’s most active, vigorous presidents. 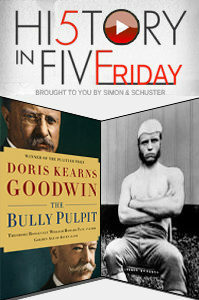 The insight comes in her latest book, titled, The Bully Pulpit: Theodore Roosevelt, William Howard Taft, and the Golden Age of Journalism . She previously touched on the extended Roosevelt family twenty years ago, writing No Ordinary Time: Franklin and Eleanor Roosevelt: The Home Front During World War II , for which she was awarded the 1995 Pulitzer Prize for History. You can follow her @DorisKGoodwin on Twitter.